english name "Little Dove Ringless Amanita"
intro The following description is based on original research by the authors of this page. cap The cap of this specis is about 47 mm wide. At first the center of the cap is buff, while the remainder is pale grayish. As the mushroom ages the cap becomes grayer except for the center which becomes yellower. The cap is ovoid at first and becomes broadly bell-shaped with a distinct umbo. The cap's flesh is white. The margin of the cap is radially grooved with grooves occupying one-fifth to one-fourth of the cap's radius. There is no volval material remaning on the cap. gills The gills are narrowly connected to the stem in material viewed so far; they are close and cream to white. The short gills are squarely cut-off or nearly so and not very common. stem The ringless stem of A. trygonion is 106 - 120 × 6 - 7.5 mm and white to off-white. 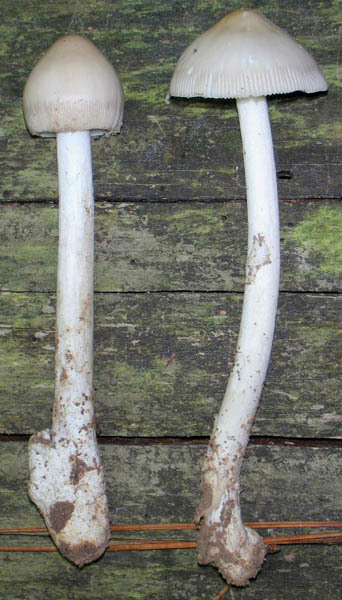 The stem is inserted in a white, persistent, membranous, sack-like volva ranging up to 29 × 15.5 mm and attached to the stem's base. odor/taste The odor of this mushroom is slight or indistinct. Its taste has not been recorded. spores The spores of A. trygonion measure (7.9-) 9.5 - 12.5 (-13.0) × (7.1-) 8.2 - 10.3 (-11.5) μm and are dominantly broadly ellipsoid (sometimes subglobse or ellipsoid) and inamyloid. Clamps are absent from bases of basidia. discussion Amanita trygonion is known only from pine-dominated mixed forest in sandy soils of eastern Texas. This species suggests Amanita sp-V01 to which the reader may wish to refer. etymology τρυγωνιων , Gr., dovelet, also a "pet name" for a little girl. The following material is based on molecular work of L. V. Kudzma and other original research by R. L. Pastorino and R. E. Tulloss. pileus Up to 47± mm wide, sordid cream becoming somewhat grayer with age, with buff disc becoming somewhat yellower with age, campanulate at first, then broadly campanulate, with distinct umbo, glabrous; context white; margin striate (0.2 - 0.25R); universal veil absent. lamellae adnexed, close, cream-white; lamellulae truncate or rounded truncate, infrequent to rare. stipe 106 - 120 × 6 - 7.5 mm, white to off-white; context ?? ; exannulate; universal veil as saccate volva, roughly cylindric or slightly flaring, white, membranous, persistent, up to 29 × 15.5 mm, adhering to stipe base. odor/taste Odor slight or indistinct. Taste not recorded. basidia 52 - 59 × 14.8 - 16.5 μm, dominantly 4-, sometimes 1- or 2- sterigmate; ??. [40/2/1] (7.9-) 9.5 - 12.5 (-13.0) × (7.1-) 8.2 - 10.3 (-11.5) μm, (L = 10.6 - 11.3 μm; L' = 10.9 μm; W = 9.0 - 9.4 μm; W' = 9.2 μm; Q = (1.05-) 1.10 - 1.33 (-1.40); Q = 1.17 - 1.20; Q' = 1.19), hyaline, colorless, smooth, thin-walled, inamyloid, subglobse to broadly ellipsoid to (occasionally) ellipsoid, adaxially flattened; apiculus sublateral, cylindric; contents dominantly mono-guttulate, with many additional small granules; white in deposit. ecology In sandy soil of mixed forest dominated by Pinus. material examined U.S.A.: TEXAS—Hardin Co. - Big Thicket Nat. Preserve, Lance Rosier Unit, 14.vi.2014 Ron Pastorino 6-14-14B [mushroomobserver #167973] (RET 622-5, nrITS & nrLSU seq'd.). discussion Some years ago, material then thought to be Amanita sp-V01 was collected in eastern Texas [11.vi.2009 D. P. Lewis 9043 (RET 430-6)]. The nrITS from the present species is very different from that of RET 430-6 (23.87% difference in pairwise comparison of tightly trimmed nrITS sequences). We have not excluded the original material that (from our point of view) defines sp-V01; sequencing efforts for the two relevant collections are underway. 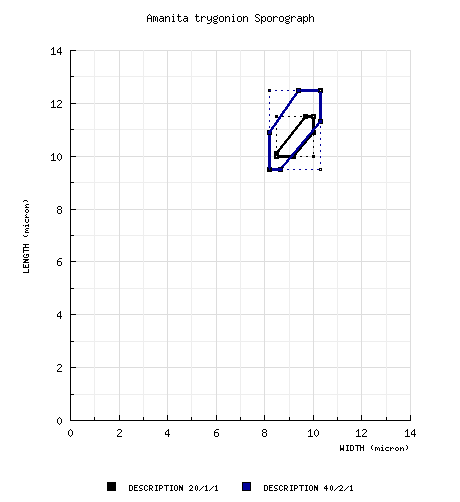 The following comparison sporograph illustrate spores size-shape information for the present taxon and for material presently assigned to A. sp-V01. Next step: Now that we have genetic data from the present taxon, we need to get the same from material identified as sp-V01 for comparison. 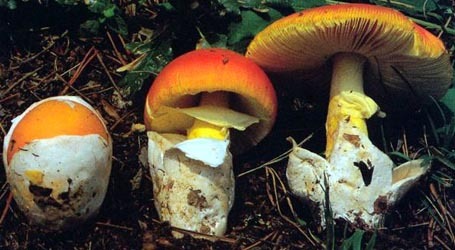 This species was formerly called "Amanita sp-T46" on this site.